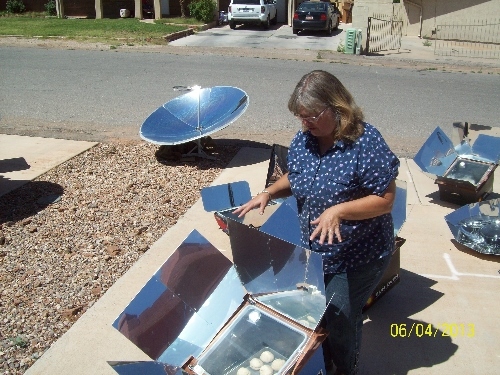 Solar Cooking Offgrid with Joyce is the place where I can share my insights, thoughts, ideas, experiences and more about my daily solar cooking endeavors that make up a big part of our off-grid lifestyle. ...So come and visit me every few days throughout the year here on this page for lots of solar cooking insight. When the housing bubble burst back in 2008, my husband and I became suddenly unemployed and I was needing to cut back and save on our finances and thoroughly researched anything that looked like a frugal acceptable way to spend less money running our household. Our air conditioner was one of our biggest drains, running almost non-stop during our long hot summers, so when I clicked on a BYU study on line done by Dr. Steven Jones about solar cooking, I felt instant excitement. My grandmother had taught Food Science and Nutrition at BYU many years ago and had been involved in the research and study of powdered milk so I knew and trusted Dr. Jones research and efforts in developing Solar cooking and soon gathered all of his info as well as any other info I could find. I then built a home made cooker from a windshield reflector. Tried a variety of foods and some worked fine but some foods concerned me cooking at those low temps for that long ( I had my food handlers permit and knew it's not ideal to cook certain meats, and dairy at those low temps for that long) and since I'm not a huge fan of food poisoning, I set out to build a Heavens flame type of Box Cooker. Meanwhile I read in the community education booklet that is published twice a year about a Solar Cooking Class being offered weekly for about 6 weeks taught by a Mr. Nathan Parry! I signed up as quick as I could and thoroughly enjoyed being taught by Nathan in the art of what would become a way of life for me! Since I already had an extensive back ground and interest in cooking, and am adventurous by nature, I caught on quickly and now this is how I cook exclusively. On a personal level, besides the savings on the municipal power, I feel great about the health benefits from solar cooking the past 6 years. Vitamins and minerals in foods are not leached out and dried up as in conventional cooking. All the nutrition stays in the food similar to when you steam foods. My husband is in his early 60's and I am in my later mid 50's and both in great health. Neither of us takes a prescription medication, or has issues in that way and we have many friends younger than we are who are not as lucky but I attribute it mostly to having a lifelong diet of mostly unprocessed foods and solar cooking is a great way to get the most nutrition from your foods. I have always enjoyed cooking and baking. And I am absolutely passionate about Solar Cooking. Solar energy is such an overlooked and under utilized gift and we need to use what ever energy is available to us without depleting the resources of this world. I love meeting new people and feeding hungry people, and I believe in and use the benefits of solar energy on a daily basis, and I believe this earth would be a much better place if everyone learned to cook this way. The Monday Curse Can't Stop A Dedicated Solar Cook! Wanted Dead or. . .Dead! Love Me Some Fresh Garden Veggies!